Once upon a time, the PAWS-Chicago Spay/Neuter clinic used to have "Spay Days", days that the clinic would be open only for feral cats. This fell by the wayside - it just proved to be too difficult and too problematic for all concerned. However, PAWS has recently revived this on a limited basis and today, Feral Fixers took advantage of this and brought in 27 cats to be spayed/neutered. We were the 'small' group with 'only' 27 cats. Triple-R-Pets brought in 35 while Pet Taxi brought in 34. Add that to the three walk-ins (from Chicago Police Officers, I think!) and PAWS had 99 feral cats to fix on Thursday. That's a lot of cats in anyone's book! Some of our cats today came from a hoarding situation in Bensenville which our organization president, Tammy, is dealing with. As such, some of these cats aren't very healthy and some have already been neutered (but not ear-tipped or micro-chipped or vaccinated or treated for fleas or de-wormed or any of the other myriad things that PAWS does for the cats). We brought in several of these today but 4 had already been neutered (but now have had the 'rest' of the package) and one, unfortunately, died in surgery. This cat had been sick and was no longer cleaning itself - the surgery just proved to be too much. While a tragedy, it was an unavoidable one - we have to get this entire colony taken care of and, hopefully, won't lose any more cats in the process. I transported 19 cats to/from PAWS while our super-volunteer Judy transported 8 more. Thank you PAWS, for allowing us to bring in such a large number of cats. It's made a big dent in our backload and has helped us immensely with this hoarding situation. With these 22 cats (27 total minus the four already fixed and the one that passed), Feral Fixers has now had 43 cats fixed in November, 774 this year and 1,385 overall. I had mused some weeks before about perhaps making 800 cats this year - now it looks like we're going to breeze by this number very soon. I wait with more and more anxiety to see the year-end numbers from the local shelters. A reminder to our caretakers - we're on break from December 16th through January 31st inclusive - we need some time off and will not be taking in any cats to be spayed/neutered during that time period. The pictures are of some (only some!) of the cats brought into PAWS today. 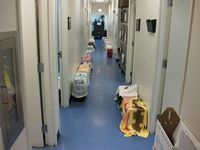 The corridors on both sides of the clinic were filled with feral cats, the special "dog room" and "cat room" were filled with feral cats, the front waiting room was filled with feral cats - cats, cats cats! 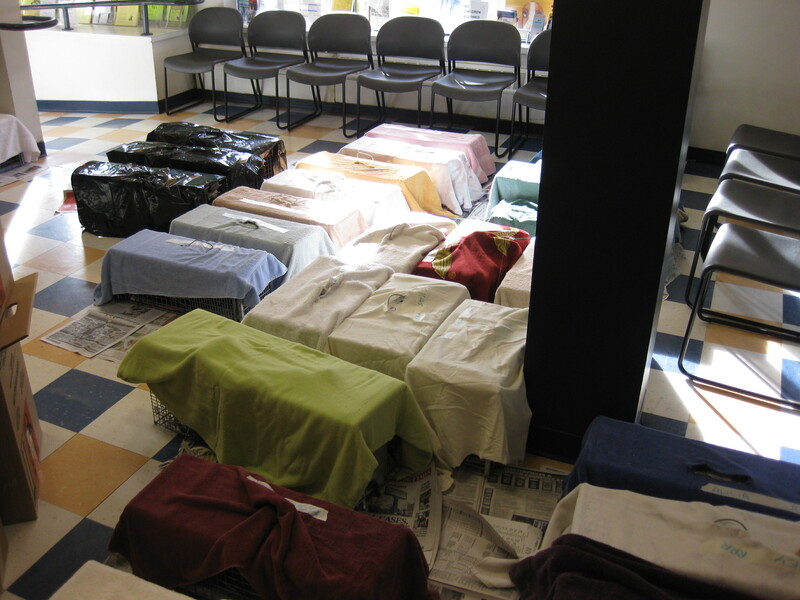 The clinic was well and truly filled with feral cats - 99 in all! Click on either picture thumbnail to see a larger version of the picture.